The second Intro project, in which there is emphasis on shapes and their arrangement. To begin, this piece’s composition is not original. The project guidelines specified that a piece created by one David Lance Goines was to be used as a reference as to how the piece would be arranged. 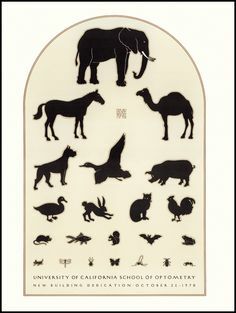 Obviously, it’s an eye chart, designed for the California School of Optometry. However, mine was not designed with optics in mind; rather, it’s a bit of a problem of mine. I design characters. Regardless of whether or not I’ll use them, come up with a story for them, or even ever draw them again, I design characters. And as of late, the character count has racked up so high that I sometimes forget their names or what they look like. In essence, I start losing focus. See the relation? As an eye chart goes down, it becomes increasingly more difficult to see what’s on it, and as I create more characters, it becomes difficult to remember them all. 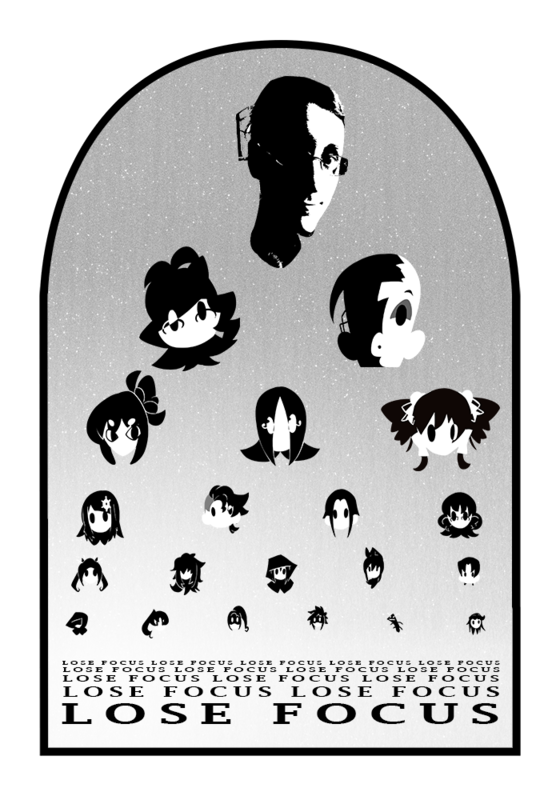 So, I chose to arrange my characters on an eye chart, with the top being the easiest to remember (my own face) and the bottom being the hardest (characters I rarely use). To fit in with the shape theme, I kept it as simple as possible: I used only black and white, and had to get creative if there were a lot of colors or things overlapped. This created a lot of interesting shapes, and made it easier to tell what was what. The gradient in the background decreases the contrast of the whole piece, but was necessary to make it possible to see the white. Contrary to the first piece, this one has a closed composition- but as most eye charts don’t exactly burst out of the page, I suppose I didn’t think it necessary. It makes the shape of the chart more visible, as well. This entry was posted in Non Time-Based and tagged Digital Art, Intro to Visual Communication. Bookmark the permalink.